Credo Mecca Gold The outstanding beauty, finesse, picturesqueness and elegance distinguish the new model in the collection dedicated to the Islam. The phone’s design harmoniously and spectacularly combines the elements of white and yellow gold producing the expressive play of contrasting shades. 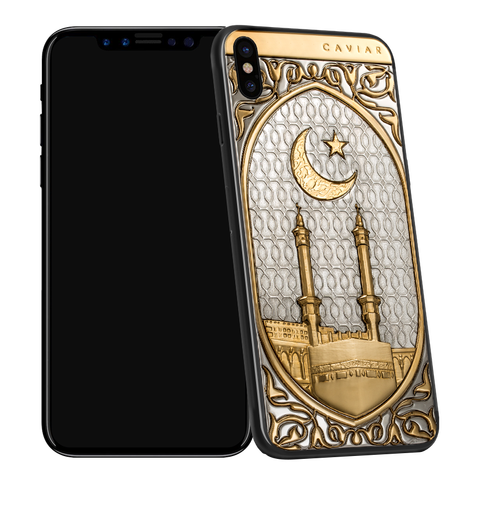 On the base covered with white there is the volumetric picture, as if it is embroidered with gold-plated lace, depicting the legendary views of the forbidden mosque Al-Haram in Mecca. 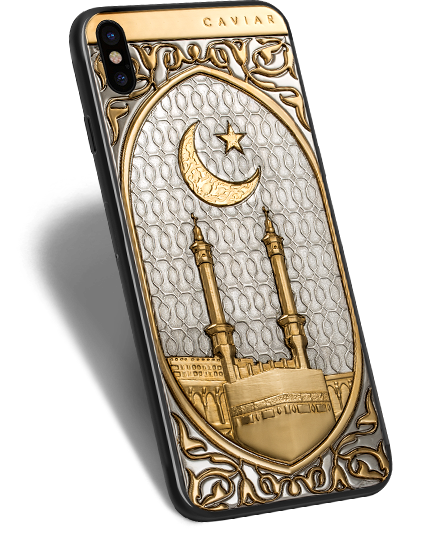 The main holy city for the Muslims where the entrance is closed for the representatives of other religions, Mecca inspired the designers and jewelers of Caviar to create this exclusive model. In the design the floral motifs that are widely occurred in the Muslim culture are used; they are adorning the building in the Al-Haram complex protecting the holy place where, according to the legend, the prophet Ibrahim was standing. The arched figure opening for us the view of the minarets and Kaaba, also repeats the silhouette of the Maqam Ibrahim. In the middle of the composition, there are a half-moon and a star as well as the shining ensemble of minarets and the Kaaba – the main sanctuary of the Islam - under them. . The outstanding beauty, finesse, picturesqueness and elegance distinguish the new model in the collection dedicated to the Islam. The phone’s design harmoniously and spectacularly combines the elements of white and yellow gold producing the expressive play of contrasting shades. 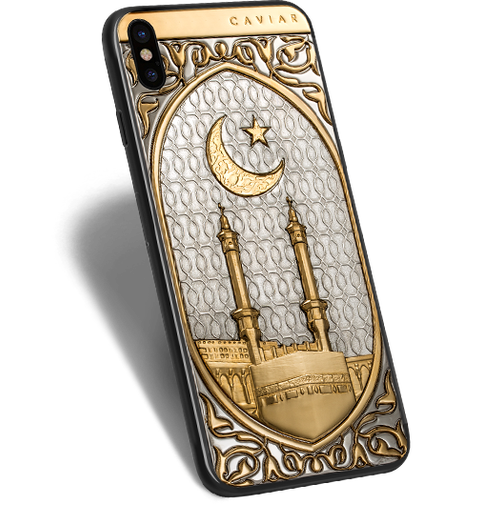 On the base covered with white there is the volumetric picture, as if it is embroidered with gold-plated lace, depicting the legendary views of the forbidden mosque Al-Haram in Mecca. 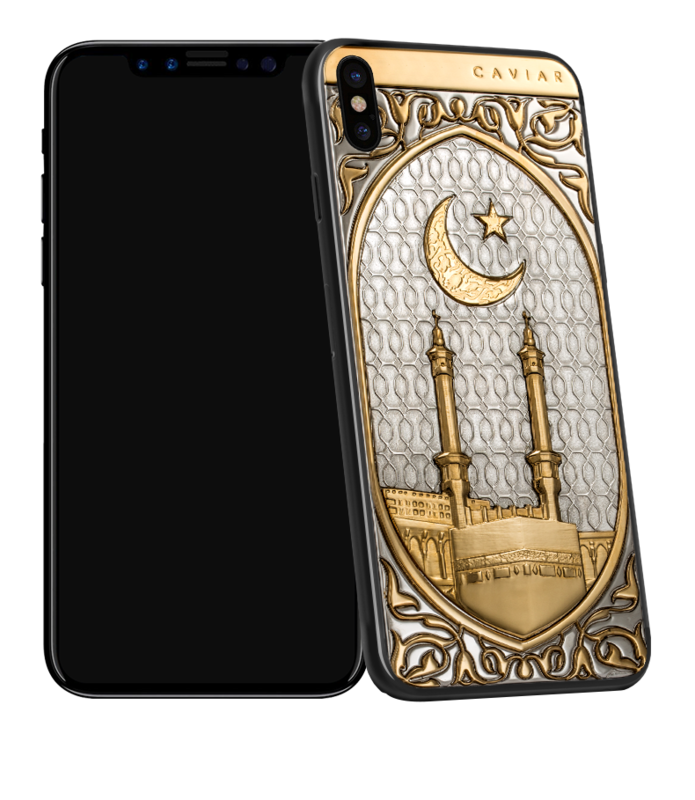 The main holy city for the Muslims where the entrance is closed for the representatives of other religions, Mecca inspired the designers and jewelers of Caviar to create this exclusive model. In the design the floral motifs that are widely occurred in the Muslim culture are used; they are adorning the building in the Al-Haram complex protecting the holy place where, according to the legend, the prophet Ibrahim was standing. The arched figure opening for us the view of the minarets and Kaaba, also repeats the silhouette of the Maqam Ibrahim. In the middle of the composition, there are a half-moon and a star as well as the shining ensemble of minarets and the Kaaba – the main sanctuary of the Islam - under them.